The Guardian reports on Birmingham’s Community Asset Transfer work. The benefits of transfer are clear – community empowerment for local people and asset disposal for the council – but how do you overcome the hurdles? In Birmingham, the council built on its involvement in the government pilot, recently agreeing a new protocol outlining a consistent path to transfer, from initial expressions of interest to the point of handing property or land. Karen Cheney, co-ordinator of the council’s community asset transfer development programme, believes clarity is key. “Every local authority has to be very clear as to what community asset transfer means to them.” Councils can dispose off assets at preferential rates in various ways including freehold, a long lease, a shorter lease or a licence to occupy. In Birmingham it involves transferring leasehold, because “that’s protecting both sides – if it is freehold it’s gone and if it goes wrong, retrieving the situation is more costly”. Birmingham’s transfer website is clear, packed with information and avoids any overt council branding. She also spoke to Masood Yasin of comm:pact about how he organised the transfer of Hutton Hall – which is also covered on this site. Sport England have just launched an interactive asset transfer toolkit for sport – commissioned by Sport England and produced by Locality’s Asset Transfer Unit. The toolkit is a good first point of information on asset transfer from a sports perspective. The toolkit provides information, resources and case studies that will be of use for anyone attempting asset transfer in a sports context. There are more resources and case studies on pools in the Pool Watch toolbox. UnLtd and Channel 4 have just launched a simple programme which might help someone prime some work for a community asset transfer. Below is lifted from the Unltd website. The Spaces 4 Change Awards from UnLtd and Channel 4 provides funding and support to entrepreneurial individuals across the UK. We are looking for innovative ideas that unlock unused or under-utilised spaces for young people aged 16-25. Spaces that can be used to practice their cultural, creative or sporting passions. 32 Awards of up to £5,000 for individuals or informal groups to set-up and run their own project and support from a dedicated Development Manager. Allows young people to practice their cultural, creative or sporting passions. Be used to fund living expenses. On Friday, 1 April 2011 a celebration event was held at Hutton Hall Community Centre in Washwood Heath to show off the fantastic art work on the outside of the building and for its very imminent community asset transfer hand over to Commpact from Birmingham City Council. 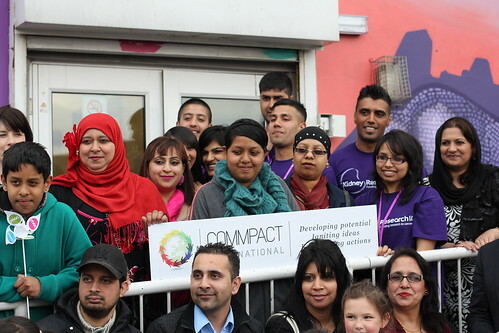 Masood Yasin, Senior Project Manager at Commpact in Washwood Heath – with a whole host of volunteers and support from Macarts – has led this project through the community asset transfer initiative. In this audio, Masood talks about the challenges of working through the community asset transfer – it’s been 2 years’ work. He also talks about how the hard work has paid off in a rejuvenated community centre that looks fantastic and will be a great place for young people, families and community groups to meet. He wants the centre to be the hub, the heart of the community, for everyone in Washwood Heath. Cascading Asset Transfer was a course run by the Asset Transfer Unit and funded through Capacitybuilders Income Generation Workstream, funded by Capacitybuilders and the Asset Transfer Unit. The aim of the course is to equip workers in VCS infrastructure support organisations with the knowledge to support both VCS groups and local authorities considering or undertaking community asset transfer or asset based development. ‘Assets Ambassadors’ in local infrastructure organis- ations who can recognise and understand asset development opportunities for VCS organisations, can help develop projects and can signpost appropriately and confidently. More confidence and understanding of the process will lead to better quality projects being developed and a network of asset transfer expertise across the country. The course development has been based on the Asset Transfer Partnership Routemap published in 2010, which uses case studies to map the key stages involved in successful asset transfer. The course will explore each of the crucial stages, helping those who work to support the VCS to understand the role they can play at each stage and to learn and recognise good practice. What is community asset transfer? The 2008 Quirk Review identified clear benefits from local groups owning or managing assets; as a means of empowering communities and as an effective way for local government to achieve its goals. At its simplest, community asset transfer is a process by which the management or ownership of land or buildings in local authority ownership is ‘transferred’ to the voluntary & community sector (VCS). Community ownership can bring together people from different backgrounds. It can foster a sense of belonging. It can play a role in enhancing the local environment, alleviating poverty and raising people’s aspirations. Fundamentally, it’s about giving local people a bigger stake in the future of their community – the ‘Big Society’ in action. Participants on the Cascading Asset Transfer Course on the issues facing communities around Asset Transfer. The tools and resources developed and provided by the Asset Transfer Unit are useful and good. There needs to be more information about where groups can find sources of support. There is a huge amount of uncertainty in communities at the moment about the potential future of assets and their own sustainability as organisations. There needs to be more support and information on the financial support which may be available to help groups with asset transfer. Infrastructure organizations are being asked to make recommendations to their own local authorities so it is useful to be able to have additiona support services through the ATU to refer people to. There is a concern that the community won’t have access to “good” assets rather than those which can’t be sold quickly for capital receipts. There seems to be a big push coming from local authorities and government for assets to be taken on by third sector groups- decisions may be rushed and viability is a concern. Case studies are ALWAYS useful, and those available on www.buildingcommunity.org.uk are a good way of communicating ideas and stories. Navigating Community Asset Development can be confusing, hard work and scary. Working with a whole range of partners, technical experts and professionals can be daunting even for the most experienced of groups- even harder when often you are doing this in your spare time as a volunteer! The Asset Transfer Unit has produced a second edition of To Have and To Hold by Lorraine Hart. This is a comprehensive guide to community asset development, written by an experienced practitioner and designed to give confidence. The Building Community resource has been developed by the ATU to showcase real time, real life stories of Asset Transfer from around the country. It has been designed to inspire and inform, and contains community centres and castles and everything in between! Persuading Local Authorities to understand, support and resource Community Asset Development can be quite a challenge. Through the Advancing Assets for Communities Programme however, 100 local authorities rose to the challenge of developing a robust and strategic approach to Asset Transfer. Written by Anthony Collins Solicitors, this is a suite of documents including models Heads of Terms and Leases designed to help third sector organisations and Local Authorities become better informed about the legal issues related to Asset Transfer.